Sandy Felton talks to Peter Donegan, the delightful Irish voice behind The SodShow podcasts, about the show and why he says he is just ‘a big kid who still wants to know why!’ Oh – and he likes ‘dancing’ a lot. I have to confess that I am somewhat addicted to Peter Donegan’s SodShow podcasts. I think too, in many ways, that we are kindred spirits – Peter’s efforts are all at his own expense and so too, we at Reckless Gardener, produce what we do because we love gardening and want to share that enjoyment with others. The fact that it is at our own expense is academic. He was somewhat horrified when I asked him if he would do an interview for the website. Like me, he’s used to being on the other side of the interviewing process and I wasn’t sure whether or not our individual techniques might get in the way of each other! However, Peter was, as he put it, ‘happy to dance‘, and so here we are. Back in the day when Peter started the SodShow in 2010 there was little by way of garden podcasting. He will tell you that he is one of eight children and that his mum and dad reared him with a “don’t just say something needs change – just get up and change it,” attitude. At the time he felt horticulture needed something more interactive and so, remembering his parents good advice, he started The SodShow as a formalised weekly garden podcast. What started as giving gardening advice into the tail end of his iphone developed in 2011 into a radio show. Then in 2016 Peter left the airwaves and returned to digital format. The rest, as we say, is history – the show was shortlisted for Best Radio Broadcast at the Garden Media Guild Awards (2017) and was named in Gardens Illustrated six Best Podcasts of 2018. He has also broadcast on Radioactive, Salt Lake City, so it’s fair to say that categorically he ‘has arrived’. What I find impressive about Peter is his ability to find people from such diverse areas of horticulture. 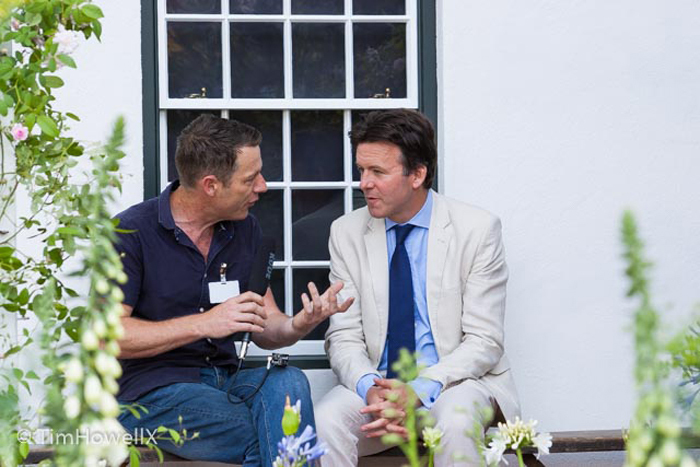 From top garden designers, tv presenters and botanical horticulturists, to herb specialists, growers and nurserymen, he manages to seek out this amazing variety of people and then in his own beguiling way, have the most amazing conversations. Recently, we were treated to an interview with the Keeper of the Queen’s Gardens, John Anderson, then Mark Diacono followed by Claudia de Yong while at the time of writing it is Butter Wakefield taking centre stage. There is no doubt that Peter has earned the respect of the horticultural industry with The SodShow and this is clearly demonstrated by the people who have agreed to go on the show – a look at his podcast list is like a Who’s Who of horticulture. Among my own personal favourite podcasts I have to list those he did with Andrew Fisher Tomlin, Charlie Hart and Matt Keightley – but every SodShow – each lasts 30 minutes – has that entertaining factor and it always comes down to Peter’s easy style and his ability to get his subjects to chat with him so we can really understand something of the personality behind his guest and what makes them tick. The SodShow is not Peter’s day job, although his professionalism and that special technique he has for drawing people out in his interviews would suggest that it is. He laughs as I point out that for me, he is the Terry Wogan of garden podcasting, however, his affable style and ease of manner has a lot in common with that great man. He has a way with the ‘Craic’. 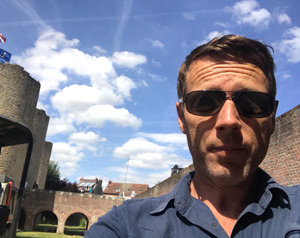 His day job is his Dublin based landscaping company – Peter Donegan Landscaping Ltd – and so I wondered how he managed to fit in the podcasting with his need to earn a living: “There are no negative words that can describe making The SodShow,” he says. “I get to chat with people I know, respect and get on well with and honestly, if you can chat with your Mum for 30 minutes you’re halfway there. It is I’m told quite successful, I’m really unsure where all that comes from and without sounding all melancholic, it really is still just Peter having a chat. In a nutshell, think of it like a game of tennis and the day job always comes first and I’m quite content to settle for runner up to the BBC at the Garden Media Guild Awards, if you will allow me not to get big headed in any way.” Absolutely fine Peter! There is just a broad smile when I ask him what he does in his spare time so we move on – and my next question raises the accusation that I ask some tough ones! Which was – how do you achieve that knack of drawing people out like you do? He tells me that obviously there is the odd guest who is a little quieter but that’s allowed and people who have never done an interview before are supposed to sound that way: “I’ve got no idea about anything when I sit down to chat,” he says. “The only thing I know is that the listener can’t see you smile.” He admits that he is really still just a big kid who wants to know why? and so his interviews are as much about his own desire for knowledge as anyone else – whatever – it works. 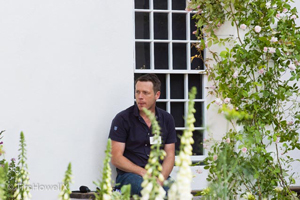 Peter (pictured below right on site) is one of 14 international garden designers who have been chosen to create one of nine gardens. 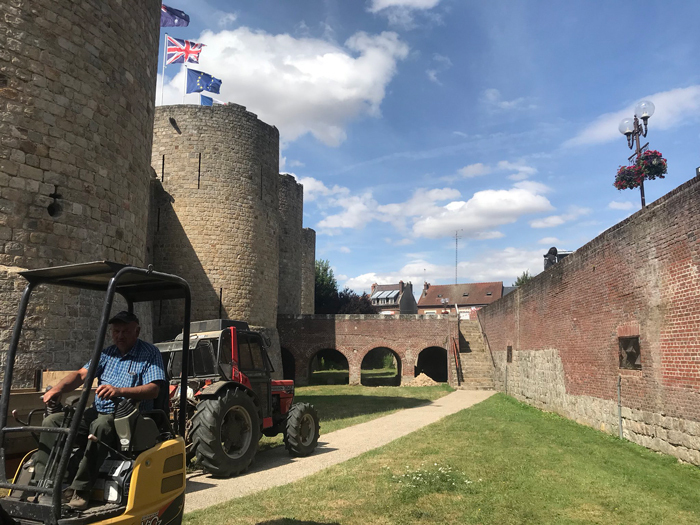 The series of perennial gardens on the theme of peace in the Hauts-de-France region will pay tribute to the countless deaths on French soil between 1914 and 1918 and bear witness to the number and diversity of the countries involved in the conflict. For Peter, it is a balance between creating a space that will enable visitors and locals to sit somewhere pleasant and peaceful, enjoy a conversation and a smile in the shade but also a fitting testament to the memory of the fallen. I am sure we can look forward to many more of Peter’s interesting and chatty podcasts and I guess at this point you may query our headline about the Guinness! Sorry to disappoint, but that is a story for another time – just ask Peter next time you see him! Thank you Peter for a lovely chat – you certainly like to dance and perhaps that is the secret of your successful podcasts – your dancing words and your total sense of fun – long may it continue.